A wondrously conceived story spanning twenty-four hours in the life of a middle-aged expatriate British professor of English at a California university, A Single Man was described by Stephen Spender as "an absolutely devastating, unnerving, brilliant book." George is a man of intellect and humor, simultaneously brash and sensitive, gentle but with a streak of benign mischief, an enjoyer and a pessimist. Consumed with grief over the recent death of his companion, he determinedly persists in the routine of his daily life. Equal parts Prufrock and Lucky Jim, George is one of the more memorable comic anti-heroes of modern literature, and A Single Man one of the strongest efforts of a major writer of the post-war generation. 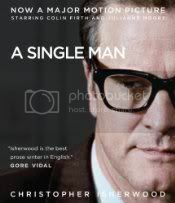 A Single Man tells one day in the life of George, a man trying to cope with his day to day existence after the death of his partner, Jim. This is a no holds barred portrayal of his existence. We meet George as he awakens in the morning, starting his day, coming to the determination that he must get out of bed, shower, dress, get ready to face his day. From there we follow him through the actions of the day, driving to work, teaching classes (he's a professor at the university), interacting with coworkers. It seems a dismal existence, but with moments of clarity shining through, we think that maybe George will make it after all. Throughout his day, Jim flits in and out of George's thoughts. It doesn't seem to take much to bring Jim to George's mind, often leaving him with at first what seem happy memories but then constant reminders of Jim's absense in George's life. Eventually, George finds himself seeking out his best friend, Charlie, who shares in his grief of a missing loved one (her's through divorce). After an evening of that closeness that can only come from such a friendship, Charlie makes one of many attempts at trying to seduce George, yet never getting any farther than a drunken, fumbled kiss. Afterward, George decides to go out, that he is not ready to go home quite yet, and happens upon one of his students, Kenny, at the local bar, and they strike up a conversation, eventually finding themselves drunk and skinny-dipping in the ocean. George may or may not be perceiving the situation for more than what it is, just as Kenny may not even be sure of the situation. George wonders if, in Kenny, he has found a kindred spirit, but we may never know as drunkeness finally overtakes him, and he finds himself alone again at the end of his day. It is a dark and somber story, and doesn't hide any of George's faults or feelings from the reader. We get George, farts and all, just as he is. There is no fantasy to George's life, just the stark reality of his situation as he struggles with Jim's death and tries to cope and move on with his own life. Despite its darkness, I felt swept along by the narrative and found myself wishing there was more to the story; a second day, perhaps. But that is all we are given, one day, and we must learn to accept that is all that we are getting, just as George has to accept that he is only getting one day of his life at a time. There is no real happy ending here, simply a real and powerful one. Simon Prebble does a fine job narrating the story. His reading is clear and he expresses George's emotions perfectly. It is a short recording (4.75 hours on 4 CDs) so won't take much time to listen to.